The above image shows Venus transiting the sun as seen from the top of West Kennet Long Barrow after sunrise on 6th June 2012. Although I managed to capture a full minute of this on a handheld HD video camera on a cloudy day it did take me 22 minutes focussed on a bright patch of the sky to get it. If you’re really keen the full video can be seen here You might want to start watching at 8.07. It zooms out and comes down to Earth at the end so that you can see that it really is taken from the top of West Kennet long Barrow. I spoke briefly afterwards to the man in the hat you can see at the end; he had been involved in a Venus transit ritual, along with a woman who had sat inside the long barrow earlier while I filmed from the top. It was a cloudy day and I don’t know whether either of them realised that the transit had in fact been briefly visible. I didn’t know I had captured it on the video until I got home. These transits occur in pairs 8 years apart with the pairs more than a hundred years apart, so without the internet and Stellarium to warn me it was going to happen I would have stood no chance of seeing it. I think it is more likely that Neolithic sky watchers kept track of the patterns of movement of Venus by observing its maximum elongations from the sun. 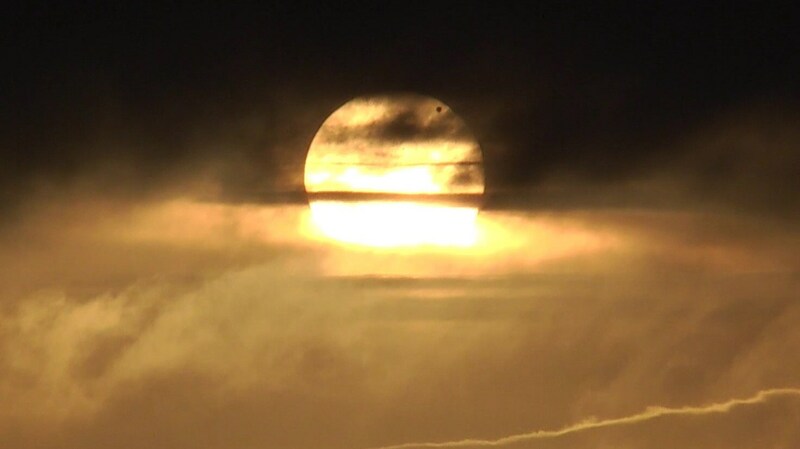 This is because the turnaround in its distance from the sun can potentially be observed and measured over the course of successive mornings or evenings whereas a solar transit or occultation is either impossible to see or too easily missed in cloudy weather, which is no good if the event is as rare as this one. Anthony Johnson recognised a Pythagorean type of geometry at Stonehenge in the same way as I have at Avebury. The reason I compare the geometry of Avebury to Pythagorean geometry is not because of any three four five triangles but because the geometry of Pythagoras included starry patterns and was associated with a belief in the ‘music of the spheres’. The concept of the Music of the Spheres appears to have arisen from the many harmonious proportions which can be found in the patterns of the cosmic cycles and are therefore part of nature. Pythagoras seems to have considered these ratios to be akin to the manner in which proportional relationships in lengths of strings produce sounds at harmonic frequencies. He also believed that numbers were sacred. There was however an element of dogma and secrecy in these beliefs which would be at odds with today’s professed ideal of the scientific method. We do not really have surviving evidence from Pythagoras of how exactly his planetary geometry connected up with musical harmonies but the nature of the belief is described and the idea seems to have survived for a very long time. Among all the later mystical allusions to this idea however it is very difficult to find any credible geometry which shows how it works. In my investigation of the geometry of Avebury I was struck by the number of patterns I found which were regular polygons or polygrams having relatively small numbers of points. One would expect an accurately measured random set of angles to tend to produce patterns with large numbers of points, whereas the geometry of Avebury as I discovered produces a surprisingly high proportion of integer fractions with small integers; a pentagram for example is drawn using an angle of 144º or 2/5 of a circle. A seventeen-pointed shape is drawn using the fraction 4/17 and also using 8/17. Along with their belief that numbers were sacred the Pythagoreans shared this liking for integer fractions, so much so that they were very upset by the discovery of irrational numbers and are even rumoured to have killed one poor man for revealing the terrible truth about the square root of two. If this is true then it would seem to indicate that the Pythagoreans suffered from a conflict between science and dogma. Some of their dogma looks very much like superstion and these attitudes may ultimately have led to their downfall. The one person person in history who comes close to explaining or demonstrating the idea of the Music of the Spheres in clear terms is Johannes Kepler. There are others who have much to say on the subject but only in general terms. Kepler studied the cycles of the planets and calculated ratios between their orbit lengths. He also famously fitted the platonic solids inside one another in a manner which enabled all the points of each one to touch the faces of the one outside it. Kepler also investigated the relationships between musical harmonies. He was very methodical but also had religious beliefs; he believed in a god who created the universe with a rational plan. I’m inclined to feel that the architects of Avebury were more pragmatic than the Pythagoreans and closer to Kepler and that whether or not they had any concept of irrational numbers they knew that they were using integer fractions as close approximations for the real ratios in the cosmos. Their calendar would have needed constant recalibration to correct for the margins of error, so the continual search for ever better approximations to reduce this need would have been of major importance to them and might even be the reason they made Avebury so huge; they might not have been hostile to irrational numbers so much as very good at finding closely approximating integer fractions.